Your skates come from the factory with the trucks tightened; so you will want to loosen them at least a bit, or else you won't be able to turn at all. 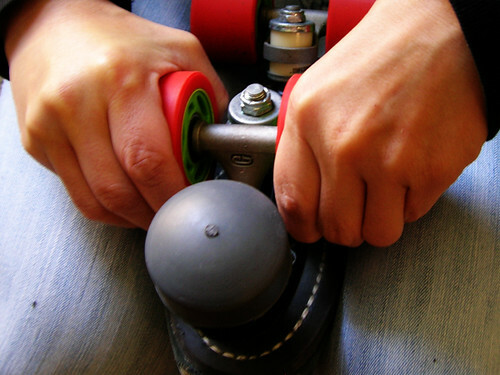 If you feel like you're willing yourself to turn with all your might and still skating into walls or if doing swizzles and slaloms seems just impossible, it probably means that your trucks are too tight. As your skating improves, you may want to loosen them even more to your liking. The truck, in case you don't know what I'm talking about, is the metal chunk that attaches your axels to your skate. To check their looseness, grab a wheel in each hand and wiggle them up and down like a seesaw. They should move at least a little bit, I personally like my trucks pretty loose and set them so the rings really wobble around the cushions there. More about cushions TK, though. 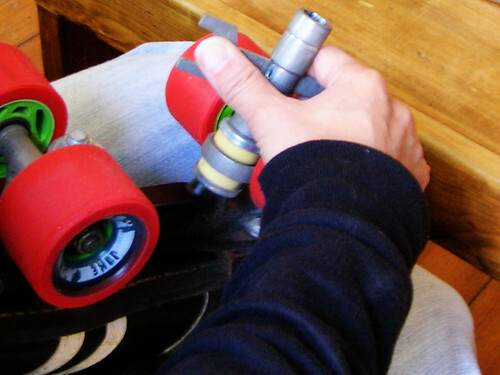 To adjust the trucks, you loosen or tighten the truck nut with your skate tool. Righty tighty, lefty loosey. Same advice as for lowering your toe stops, you can gradually loosen your trucks or you can go the full loosey goosey and reel yourself back in if you go too far. The way trucks work is, they give when you put weight on them. The front truck gives backwards and the back truck gives forwards, so that they sort of pinch together if you can picture that. You turn in the direction that the wheels are pinching. So that's how you turn: you put your weight in the direction that you want to turn, the trucks pinch, and you turn in that direction. The looser the trucks, the more responsive they are to what you do with your weight.